As someone who needed to continue reading Don DeLillo’s latest novel, it occurred to me, say it, go ahead, that my mind was wandering. Then, just as I planned to begin, I am putting away dinnerware, opening and shutting cabinets. Inside one cabinet, there is a garden; I see a ceramic Eden. It is mid-century Fiestaware. The stacks of plates, bowls, and saucers calm me. The adjacent pastels alternate warm-cool warm-cool. Rose, Periwinkle; Sunflower, Sea Mist; original ivory, white; amber, umber, lemon. A collective named them, and I imagine Ohioan’s consult in hush-hush, mumbly palter. The plates, I know, are not Sri Lankans, formerly of Ceylon, but Buckeyes. Then, one morning or evening or afternoon, the warm-cool pattern fails. Most times, the heavy dishes can be regularized by shuffling. The conscious mind removes a warm color from the bottom of the pile and interpolates it between two cools above: the pattern. I thought of being alone in the cabinet. Solitude in extremis. Am I anyone? All ane. Alone. I can be first person and third person both. Fiestaware is bright and clean as a face. Dishes might hide in sinks or on tables or perhaps there is sifted flour upon one or maybe it is a cold plate of pheasant or a stew or an old dinner roll marinating alone in the icebox. Marlon Brando, doughnuts, the Volga, Ohio. The key was always here, here for me. I feel for the clef of clay: a single original red Fiesta dish, brighter than the rest. Original red. Proto-Indo-European. The Aunt who gifted these dishes to me has been gone for some time. But she is here with me. I am her machine now. This red, she had told me when I was a boy or a girl or a woman, is neither hot nor cold, but strong while the other colors are soft. She had a feeling here, a perception, she is transrational. I wait for something to happen. It happens. Red in the stack is a leg sticking out of an open cabinet door. A car door. A flag. Someone needs to do something. This dish can be shimmed anywhere in the stack as a placeholder. A heart might skip a beat, but not now, not in these cabinets, not on these shelves. That red is the outlier that acknowledges the need to correct deviations from the logic of the color concept. It advertises that there is a problem, a problem being solved by time like new teeth and new shorelines. It says be patient, send help. I see it in the middle of a pastel wasteland, and intend the pattern to return tomorrow or the next day. One night and one morning, that is all. 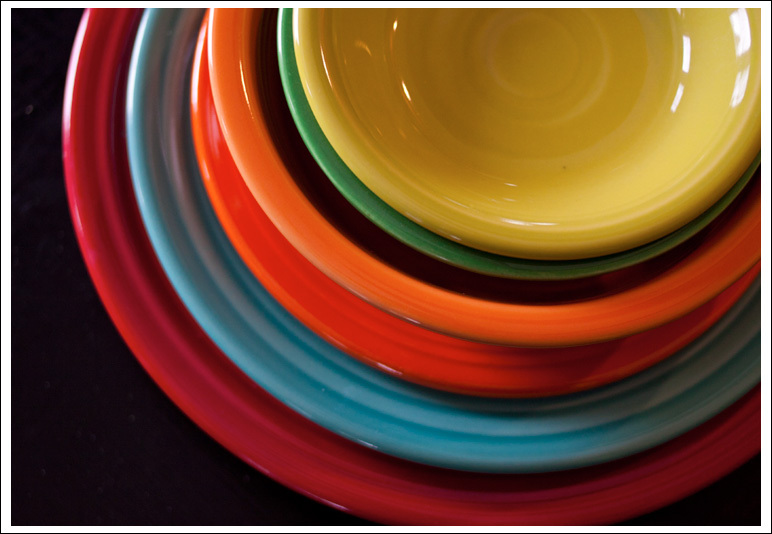 The Fiestaware arrived many years ago, in the summer, or the fall, or holiday. Nonetheless, twelve place settings arrived in a very heavy box, by an aunt, who needs a name. Hazel? It might have been Hazel or Donna or Belle. She took measure of it at a yard sale. Fiestaware is very heavy and sturdy. It is festive. I think of my kitchen cabinets, hand-made in mid-century knotty pine, that are able to sustain this heavy dishware, which will continue to sit upon the shelves long before the cabinets will have failed. Because her car was stopped veerily, with its door opened and her leg out, a driver, the first passerby, a cool driver from her future, decoded her pure drama and called 9-1-1. She had navigated the multiverse. The dishes were a smart find. She didn’t need them, but she spoke pidgin. The price was low. It’s a perfect full set, carefully packed with newspapers. Local news and appliance sales, advertising. Maytag, Hoover, area codes, common colds, obituaries. Mayhap. Mayhap was street talk from the sixteenth century. It was a compression of it may happen. My aunt opened her door and put a foot out and paid cash. She did not kiss rings or wear slippers. She did not use a prayer rug. And yet, she was saved. The dishes are clean and orderly. I held my copy of his latest novel. I drove to a hotel. Maybe it was the San Jose in Austin, or that non-smoking room at The Ritz stocked with ashtrays, or a solarium, warm and dull. But what was my point? Do I remember where I live? Do I still have a job? Will my days have names and numbers again? Wherever it was, I stayed there. I stayed with Don DeLillo’s book, his words shrinking into a long expanse, propelled by compulsive reading.